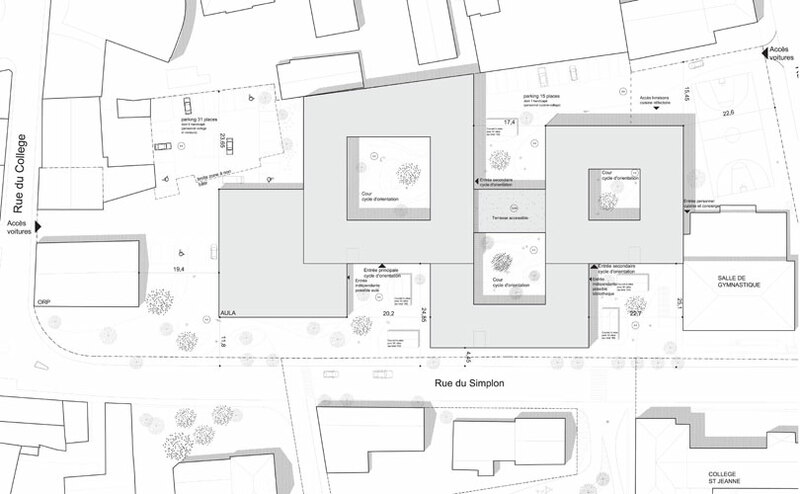 The complex is related to the existing context on two main levels. The first is on the landscape scale: The building confronts the mountains at the borders of the city creating a feeling of inclusion within a panorama constantly above the horizon. The height variations reflect the existing skyline, while the excavations relate to the feeling / perception of constant inclusion in a higher context. At the same time the plan takes into account and reinforces the local urban system, characterized by an alternation of empty and full spaces. The project gives the site a strong and recognizable structure to make the nature of outdoor spaces more clear and readable. 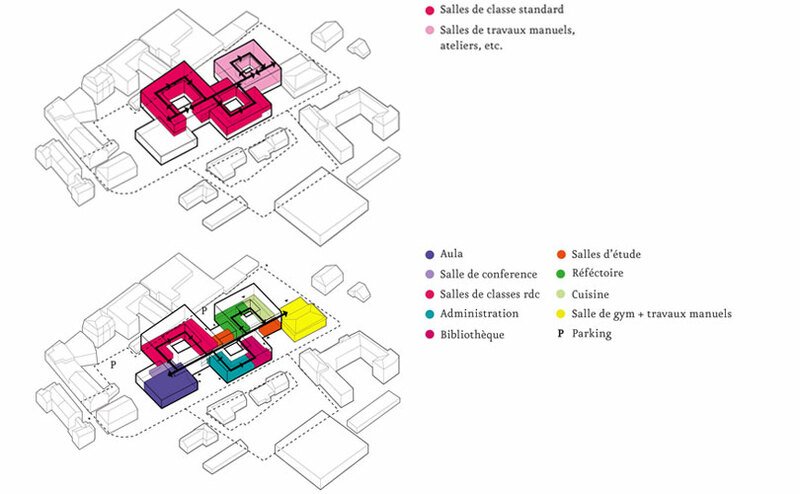 Two different types of open spaces are generated by the building: the public ones dedicated to the city, and the courtyards (semi-open spaces), reserved to the students of the school. 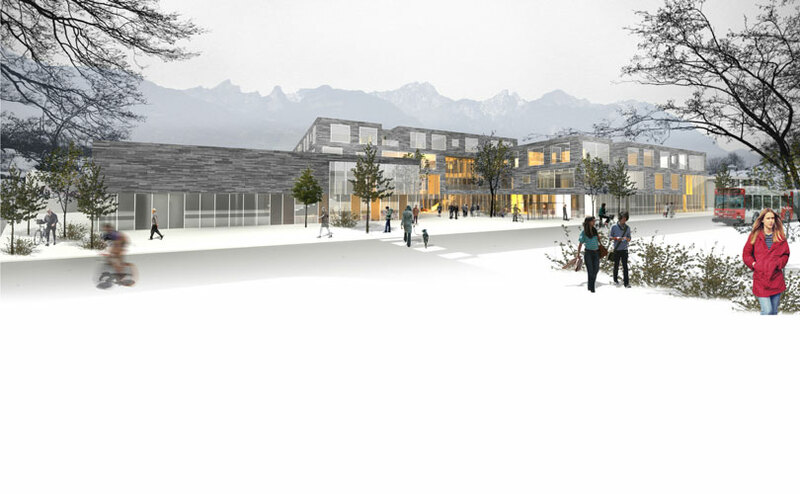 The building is designed to fully meet the functional program and to reach optimal performance, in terms of lighting, comfort and ventilation for classrooms and other areas. At the same time there is a variety of not specialized spaces intended to encourage meetings and exchanges between students of different classes and between students and teachers. We are convinced that training and knowledge transfer takes place largely through daily meetings in informal situations. 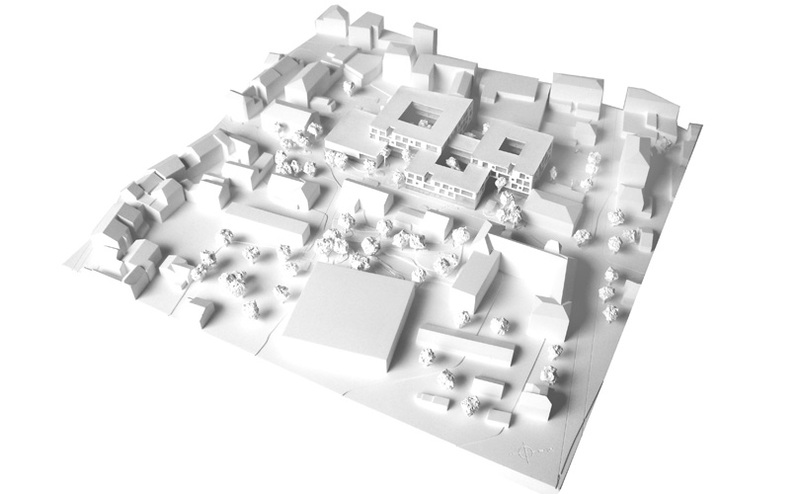 With this concept in mind, the whole building is designed as a series of environments, ranging from spaces dedicated to learning in the traditional sense, passing through more open areas where to meet and discuss, to the different types of open space where users can meet together and, finally, meet the city. 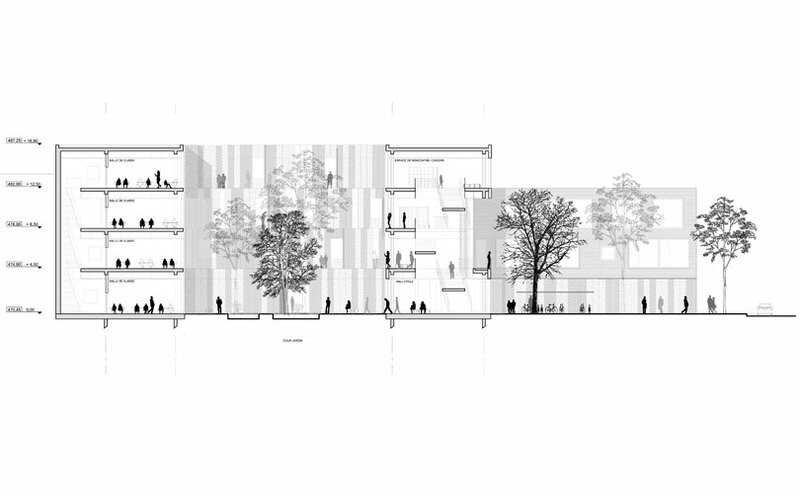 Flexibility and urban relationsThe ground floor is conceived as a city street on which major spaces open (courtyards, lobby, outdoor spaces, squares), and where one can find the access to the collective functions. 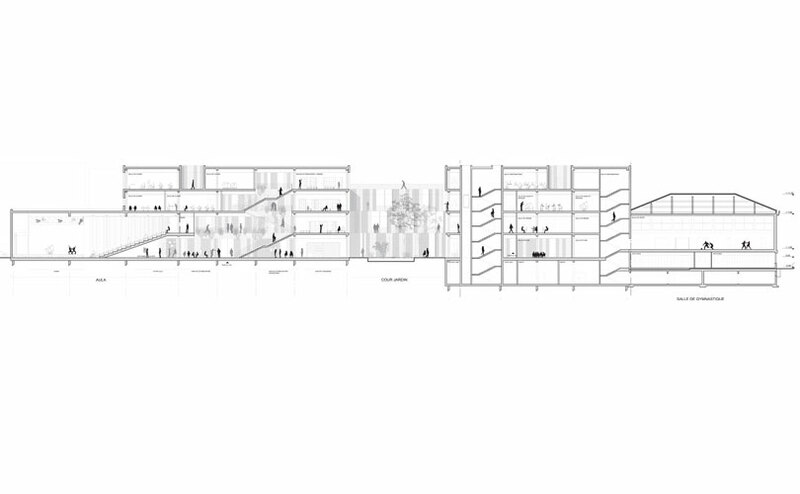 The auditorium, the study rooms, the administration, the library, the refectory, the gym, all have their entry on this artery that develops itself as an extension of the entrance hall. Some of these functions, the study rooms in particular, can open completely on this pathway, making it a flexible and variable area that can get fragmented or completely opened as required. 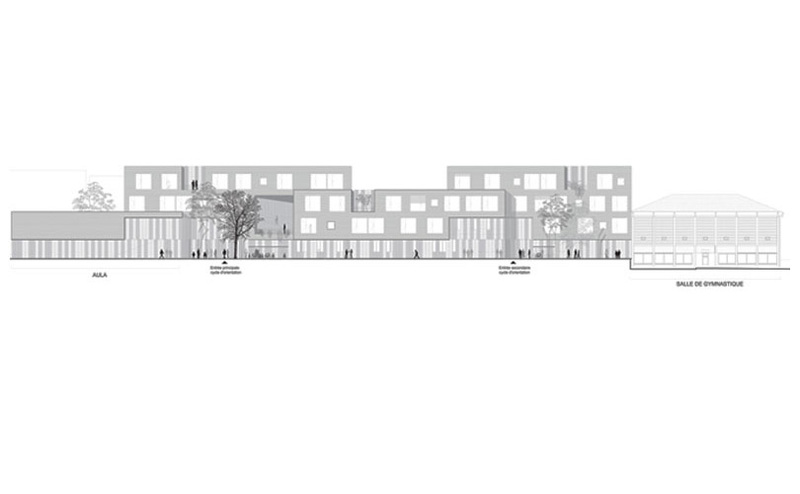 This section of the school corresponds in facade to alternated elements of transparent and translucent glass, allowing a dialogue and an ongoing relationship with the surrounding urban context. 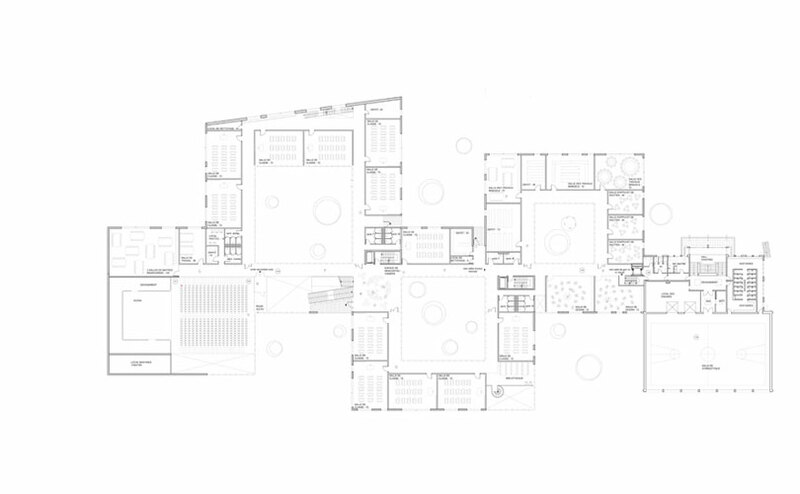 A dual system of pathways characterizes the school; interior paths are extremely rational and allow direct access to any area. 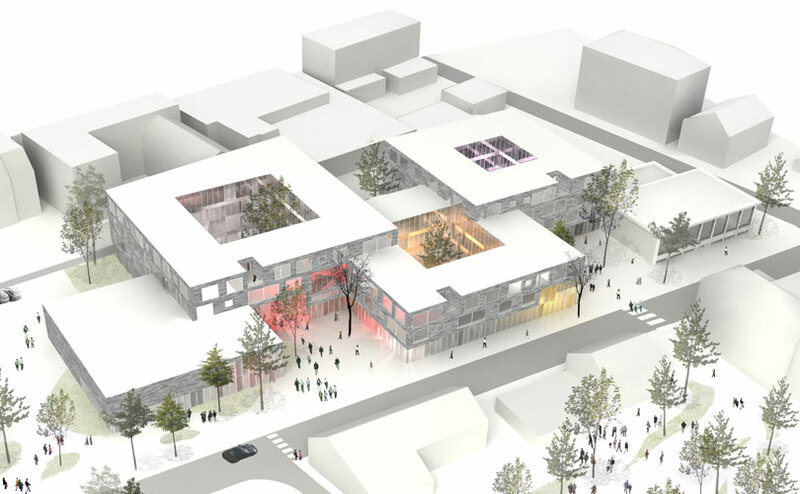 They coexist with a system of more “free” paths, which cross the outer courtyards and allow a totally different perception of the building spaces, between inside and outside. 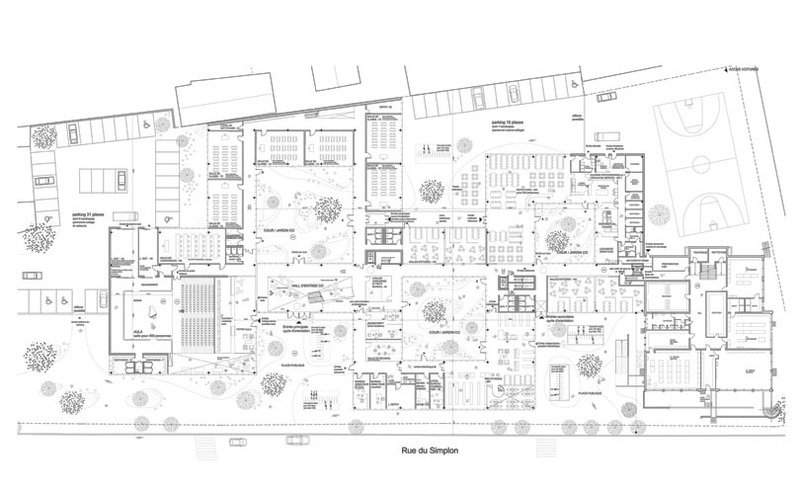 The design of open spaces then follows the logic of those last paths: it accompanies in a gentle manner the possible movements throughout the complex and opens in areas for meetings and relax. The courtyards are characterized by green, that give to these areas the shape of a square-garden, working as recreational courtyard. The squares on the outside of the building have a more mineral nature and the design of floor covering guides the movements of the people to the entrance of the single areas on the ground floor.